The client is in the business of building social networks deploying academic and sports based relationships of people. The client established this website for the purpose of creating a “career focused” and networked resource for current and former collegiate athletes across the nation. The application offers comprehensive career development programs and opportunities to current and former student athletes. This application works with the nation’s most prestigious corporation, universities, athletic programs and sports organizations to produce exceptional career programs for their student, alumni and constituents. The application allows the participating members to build their own home page and route selected information into their respective pages. 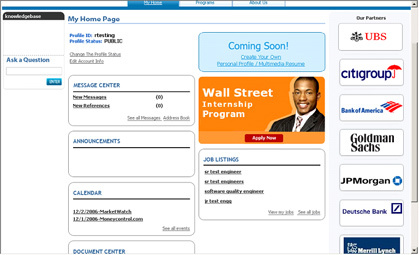 The application also allows the prospective employers to create their own micro sites with in the application. The client needed that their unique approach of career development be transformed into real product and become major resource for job seekers, employers and advisors. This project was to be the “proof of concept” demonstration for their business vision. Requirements for this application evolved as the project progressed. The database model was required to be extendable. Database had to be shared between all applications and supplications of the client. Application architecture and data base design had to be scalable. Testing of the application where requirements were evolving proved to be a complex task. Change Management during the development was a critical task. STPL constructed the application deploying Dynamic database modeling techniques. Deployment of .Net framework with reusable code components on a three tier architecture ensured scalability desired for the changing application environment. This page is the main page to enter the website. The User’s enter their respective Home page after entering the valid User Name and its Password. This module also provides the link for Registering a new user to this website. This page provides a link through which the user can recover the forgotten password. This module contains following sub modules. This module basically manages user’s home page and contains the following sub modules. 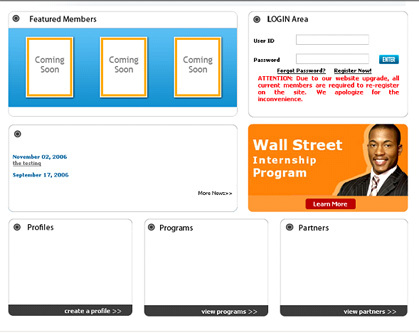 This module is the home page of Wall Street Internship Program and provides complete detail of this program. This module contains following sub modules. This module provides information about client network. This module contains following sub modules.